Admittedly it’s just a piece of metal. It twists around easily on my finger during these cold months and sticks tightly in place during summer. It’s used to dishwater, kneading dough and forming meatballs. The gold has worn well, is still shiny. The diamond attached still sparkles in the sunlight. It’s not the first of his rings I’ve worn. That was a monstrous class ring, it’s purple amethyst prominent, the underside padded to keep it from slipping off my finger. It was one of the first visible signs that we were linked together, that two hearts seeking love were connecting. In time, that first ring gave way to the diamond; then a plain, simple band made it two. 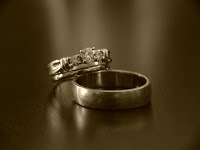 Through poorer and richer, sickness and health, job changes, moves and the loss of a child, the rings have remained, the vows they symbolize no longer just words, but a way of life. For eighteen years, wherever I’ve gone, whomever I’ve met, this ring lets others know that I am his. He’s my husband, a dedicated father to our children, the spiritual leader of our home. I’m so proud to wear his ring. I love this! Thanks for taking the time to share it with us! Oh this is one of the sweetest Valentine's Post I have read! I love this. This completely embodies the meaning of sharing that love you have for your spouse. I hope you have an amazing VDay! Thank you so much for visiting.